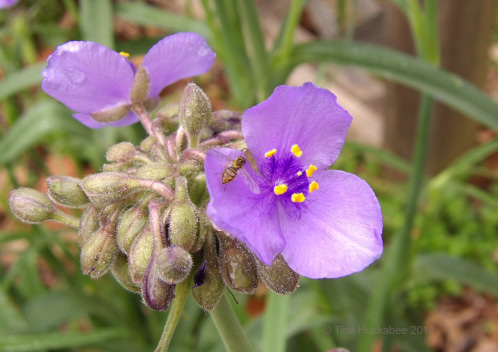 This entry was posted in Giant spiderwort, Tradescantia gigantea, Uncategorized and tagged Native plants, Spiderwort, Texas Native Plants, wildflowers by Tina. Bookmark the permalink. Hey, this is off topic, but did I just trash one of your earlier comments? I replied to something you said and got a weird message that the comment was trashed! I do not see your comment anymore. Well, I don’t know. Which comment and which post? It was the one you replied to above. I don’t know what happened to it. it looked ominous, but don’t worry about it now. Purple happens to be my least favorite color, but for a while, it was the most popular for our rhododendrons! They happen to excel at purple, which makes purple fun. White, which is my favorite color, is not so fun with rhododendrons. Orange has traditionally been my least favorite, but I still have plenty of it in the garden. There are two times of the year that purple is the prince of colors in my garden: now and in August. Rhododendrons–so gorgeous and all I can do is look and admire! Flowers have a sneaky way of doing that. They make us like the colors we don’t like. There are some flowers that are at their best in certain colors. I still prefer lavender wisteria and lilac. They do not look as good in white (except where white just happens to ‘work’). Nasturtiums are best in yellow and orange, and so on. That’s so true! I’ve seen cultivars that have the weirdest and most unattractive colors. I suppose someone like them, or the big ag/horticultural companies wouldn’t create them. 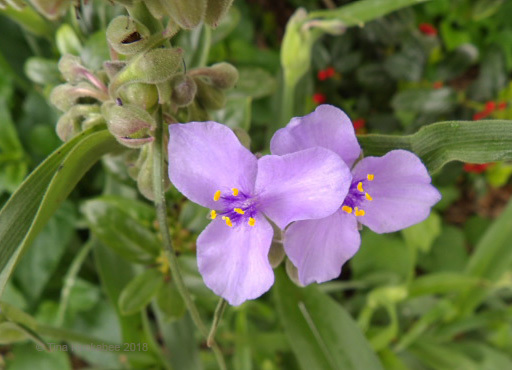 I have a tendency to plant to the blue end of the spectrum when I can and your spiderwort is making a lovely show (a bit like verbena bonariensis). I have to say that I like the look of your irises even more though. Like you, I plant the blues, though they have to prove hardy enough for me to tolerate in the garden. That iris is a great one; I have no idea what it is, but have grown it for a long time. I wish we lived closer to one another, Allison–I’d share! Tina your photos are magnificent. 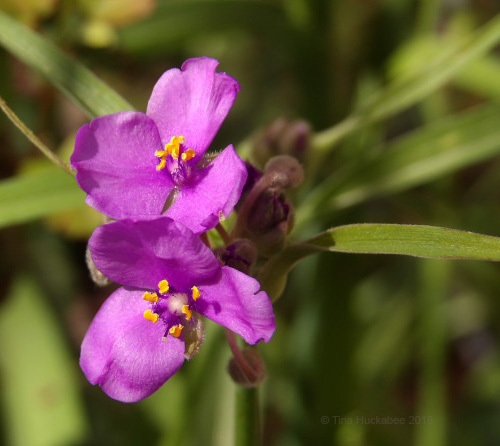 The purple Spidewort with its yellow pistils is a very beautiful flower. 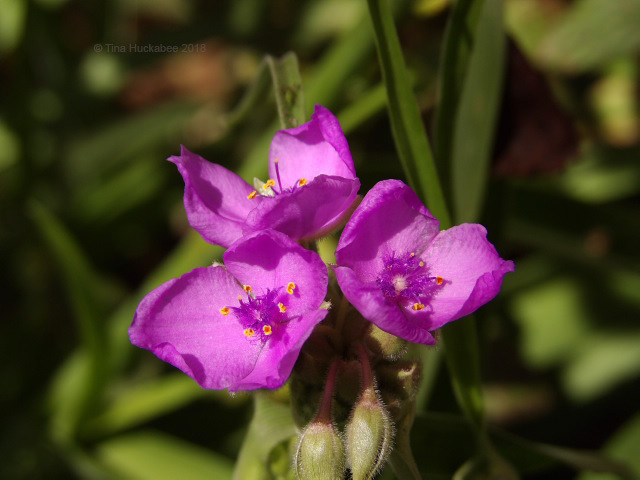 The pinker Spideworts are gorgeous. The whitish spidewort are delicate and divine. 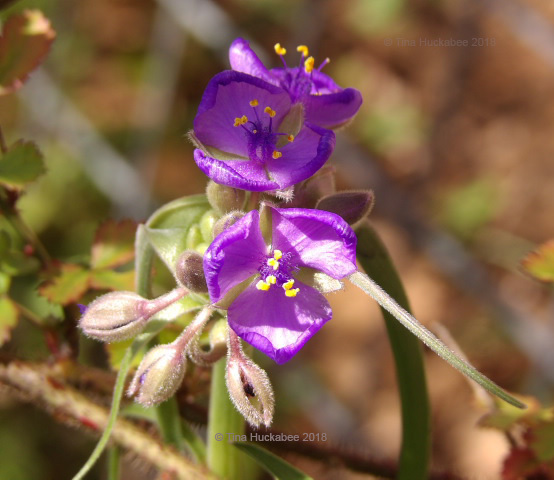 The Spideworts besides that their flowers are beautiful, they are a delicacy for pollinators. What more can you ask for a flower! The photo of the bee I love. 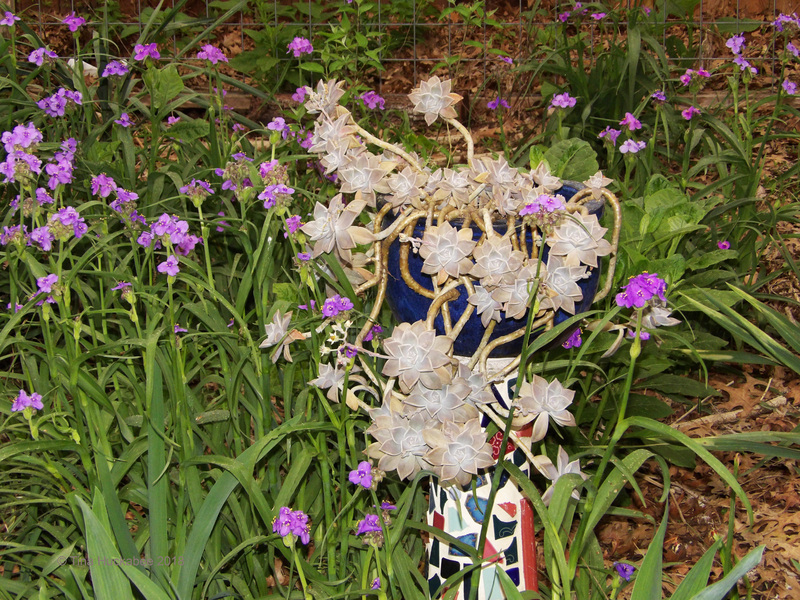 The view of all the purple Spideworts with the Iris of the same color is beautiful. I am very happy that it is Spring and the temperatures are pleasant. Here in Spain it is very cold. Have a nice week. Greetings from Margarita. Thank you, Margarita! They are lovely early spring bloomers, I just have to make sure they don’t take over the whole garden! I do hope your weather warms soon–I’m sure you’re tired of the cold! Yes, Tina, he’s absolutely right. I’m tired of so much cold. But by the end of next week, it’s more likely that another wave of cold with snow will return. The weather is crazy! But I’m glad to see his garden full of flowers and imagining the good temperature he enjoys. Greetings from Margarita. An enjoyable posting and I very much like the term “pollen pantaloon”! Oh boy, you have a lot of Tradescantias!!! I just planted some last fall – it’s just coming up. And, just like yours, it is a fabulous dark purple! Yes I do! It started with 3 or 4 and well, now, it’s way more than that. I don’t mind culling and weeding though. And, I’m happy to share! I have escaped to the hill country for the weekend, and on my way here, I was stopped dead in my tracks by a field — a huge field — of groundsel. 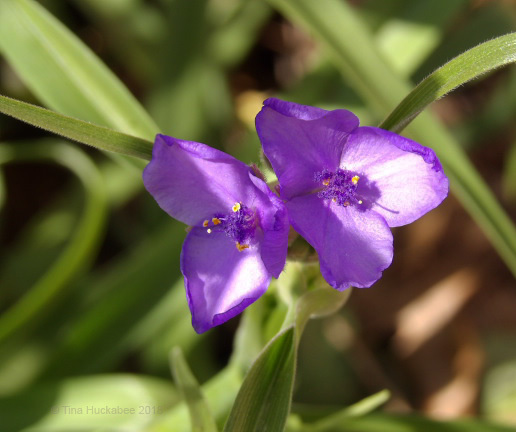 It was fenced off and hard to photograph, but in the dirt of the road, the pretty spiderwort were everywhere, blooming in sand and caliche. Hardy, indeed! And just like yours, they ranged in color from the palest blue to the deepest purple: all in the space of a few hundred yards. 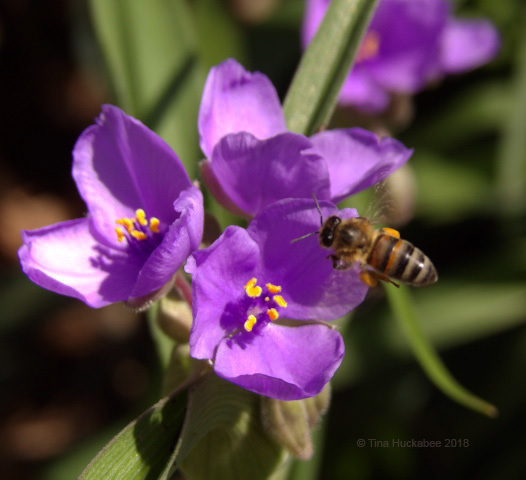 And speaking of purple…. yes, indeed. There is mountain laurel blooming. The big treat was finding it not in city or residential plantings, but out in the country, in rocky natural areas. The plants weren’t as extravagant as well-tended ones, but it was delightful to simply come across them. A whole field of groundsel–woohoo!! That’s blast of sunshine, if ever there was one! Yes, it’s been a decent year, I think, for our many native spring bloomers. I’m so glad you’re able to see a Mt. Laurel in its native habitat–I do hope you nudged the pollinators aside for a minute and stuck your nose deep into the blooms! No need. The scent of mountain laurel filled a couple of valleys. It was extraordinary! Oh it must have been glorious! I love my two Mt. Laurels, though they’ve never bloomed as fully as others that I see. Glad your Hill Country, native plants venture was a success. 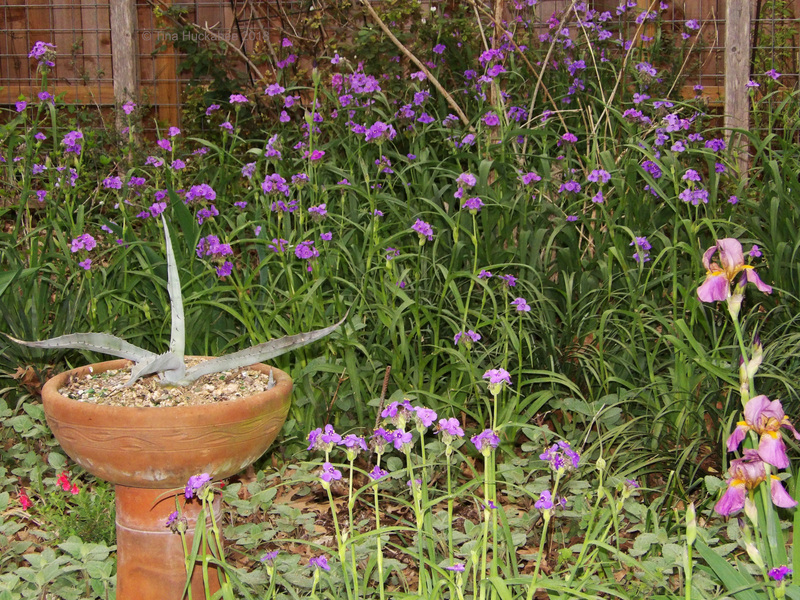 I’m at once waiting for my garden to go through its purple phase while trying to transplant bulbs before it happens…. Our gardens do have their particular phases, don’t they?